Venue: Hampden Park, Glasgow Date: Tuesday, 7 September Kick-off: 2000 BST Coverage: BBC Radio Scotland and BBC Sport website. Highlights on BBC One Scotland at 2235 BST. With a hat-trick of English Premier League titles and a Champions League winner's medal to his name, Darren Fletcher would be forgiven for not getting too excited about a match against the footballing minnows of Liechtenstein. However, when the Manchester United midfielder leads Scotland out at Hampden on Tuesday it will be his 50th international appearance. And it is sure to be a proud moment for the 26-year-old from Dalkeith. 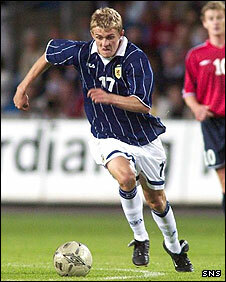 "For such a young guy I think it's a huge achievement," said Scotland assistant manager Peter Houston. "He is the captain of his country and at this early age he is getting 50 caps, so great credit to him and I'll be delighted for him if he is taking the team out." Fletcher has only ever known the famous red of Manchester United and has locked horns with many of the greatest players on the the world stage but the Scotland skipper remains a down-to-earth character. Refreshingly modest and articulate, he is a player with incredible energy, fierce in the tackle, with a wide range of passing and an eye for important goals. Yet there is nagging criticism that his club performances are not matched by his international efforts. How do Fletcher's roles differ for club and country? It is an overly harsh charge that Fletcher has grown weary of hearing and one that was inverted early in his career, with United fans asking when he was going to demonstrate the skills he was showing for his country. Of course, now he is an integral member of Sir Alex Ferguson's team. "I am my biggest critic," Fletcher said ahead of Friday's 0-0 draw in Lithuania. "I know that myself. Maybe my form just now for Manchester United is better than my form for Scotland. But that is something that I have to try and put right. "I have had the reverse said about me. People claimed I did not produce international form when I played for Manchester United. At the start of my career that was said. "In an ideal world you would like to play brilliantly for both. Sometimes that does not materialise for whatever reason. It's not a case of my trying harder for one rather than the other. I go in with exactly the same desire. You will always get 100% from me." In the blue of Scotland, the onus is often on Fletcher to provide the creative spark, while at club level he can rely on a host of other stars to help unlock defences. It is also true that Manchester United enjoy being in the ascendancy more often than Scotland and he is afforded ample opportunities to get forward and join in attacks. Fletcher, who has scored four international goals, may not have shone in the frustrating draw in Kaunas but Houston was pleased with the midfielder's contribution. "We feel that he does a smashing job for his country," added Craig Levein's lieutenant. He passes the ball well. His energy levels show he is fully committed. "He plays in a club side every week who are one of the top teams in the division. We are a small country in many ways. We find it difficult at times to play against top countries with bigger populations, but one thing that Darren has shown for Scotland is that he is fully committed, he is always here, always wanting to play. "We can't expect Darren to play well every single game but certainly if he gives us a performance like the other night we'll be more than pleased." Berti Vogts is not recalled with much fondness by the Tartan Army but it was the German who handed Fletcher his first cap. A skinny teenager came off the bench to replace Maurice Ross for the final half hour of a goalless friendly in Norway. Fletcher has made amazing progress since that Oslo outing in August 2003, amassing a glittering haul of trophies for his club. His Champions League medal came as an unused substitute in 2008 and a cruel red card denied him the chance of playing in the following year's final. In characteristically determined fashion, he did not allow the disappointment to unsettle him and his consistent performances earned him a place in last season's PFA Premier League Team of the Year. 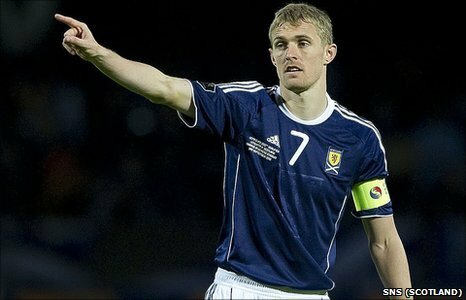 Tuesday will be the 12th occasion Fletcher has captained Scotland and he will be equally resolute in his quest to add significantly to that tally.